G2R Otter Escape is another point & click escape game developed by Games2Rule. 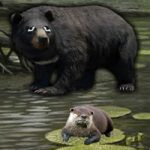 In this game, two bears are about to attack an otter! Your aim is now to save that marten from the raid by finding useful items, hints and by solving puzzles. Click on the objects to interact with and solve all puzzles you will encounter on your mission. Good luck and have fun! stuck in first set. can't find hint for green/yellow flowers or the last butterfly for the door. Is anyone here? Did you throw the coin into the river? Thanks all. I had to leave. back now and moved on to third set. I can't find a match or lighter to set branch on fire. POP found the stones. Last green square was tricky to find. You could have left a hint as to where to find these stones before you left lol. I have been back and forth to every scene, and must be overlooking them! Pixel hunt at very end: last green tile in tree behind branches in road, thanks LetMeOut! What do you do with the stones? Thanks also LetMeOut for hint about the last green tile!